About a year ago, a friend shared with me a graphic from an informal survey on the Peak Prosperity website. This is Chris Martenson’s site, which hosts a “Crash Course” consisting of 4.6 hours of quality video content describing why we should worry that tomorrow may not be bigger than today, and why the growth phase may be just that. As a related aside, I once did a podcast interview for Chris Martenson. The survey asked people to indicate their personality type as classified by the Myers-Briggs mechanism. Keep in mind that these are people visiting the Peak Prosperity forum. We’ll call these people “receptive to the cautionary message.” Or at least engaged in the issue—be they supporters or detractors. I’ll define the types in a bit, but first let’s look at the data from Peak Prosperity. We see a huge spike for the INTJ type. Want to guess what type I am? The result was pretty stunning. Of the 114 responses, site visitors were dominated by INTJ types (43 in number, or 38%), even though this group constitutes about 2–3% of the population. The website appears to be highly selective. It’s as if you called a meeting in San Diego to discuss drill bits and almost half the attendees were red-heads. If accurate, the implication is that less than 8% of the entire human population is likely receptive to the cautionary message on Peak Prosperity (and by extension, Do the Math—the numbers from which suggest an even smaller number). That’s a small fraction of the population, and likely well short of a “critical mass” for preventive action. So we may be committed to crisis. Motivated by this stunning result, I went to Do the Math readers to get another survey of the same nature—but this time with a much greater degree of control and knowledge about the methods. I got almost 1000 unique responses, and the result is strikingly similar—if not even more skewed. I’ll defer showing it until a bit later. We will first take a detour to explain the Myers-Briggs indicator, and then tease out some interesting results from the new data. I can’t add to what’s been said about MB types, and recommend the Wikipedea page for background. I will, however, offer a brief elucidation so that you don’t have to run off elsewhere to at least master the lingo. The MB indicator has four fields/characteristics that each contain one of two possible letters/traits. Thus there are 16 possible combinations/types, which would result in 6% per type if uniformly distributed (not the case, of course). Every person has some of both polar characteristics, and some individuals will be kind-of in the middle (not convincingly to one side or the other). The first field is either an I or E depending on whether a person tends to feel depleted or energized by social interaction. The second field is S or N. Does a person rely mostly on direct sensory input for their information, or does it come more from a synthesized, abstract, intuitive read of a larger set of inputs? Think of this one as concrete vs. abstract tendencies. Someone who holds a snowball in front of Congress to argue against climate change is a hard-over S-type. The S/N dichotomy is perhaps the most important attribute when it comes to whether an individual would entertain Do the Math views. The T/F dichotomy is pretty self-explanatory. Does a person place more stock in cold logic and deduction rather than in consideration of other peoples’ needs and feelings? Spock or Kirk? The J/P designation is the hardest for me to describe. Judging does not mean judgmental. Technically, J-types rely more heavily on their T/F facility and P-types rely more on S/N when it comes to processing information from the world. As an emergent property, combine T with J (like me) and you have a punctual planner on your hands. Put these four traits together and you make people. There are loads of pages and books describing attributes of the MB types. The official Myers-Briggs test costs money to take. But there are plenty of knock-offs you can find on the web (like here—be aware that scoring 56% in a category means 56% of the way from neutral to hard-over; or here; or here). If you want to see a pretty accurate description of the INTJ type, for instance, see this link (and edit last four letters of URL to see other types). It can be fascinating to read about the various types. When I read about INTJ, I find myself saying: “Yup, they’ve got me—how did they even know that about me?” It’s not like horoscopes with lots of generalities such that anyone might identify with significant portions of any description. When I read other Myers-Briggs type descriptions, I find far less overlap. And unlike astrology, which ridiculously ties personality traits to time of birth, the MB type is based on your personal, presumably honest responses to a battery of questions: the result is self-directed to be a personally relevant/accurate reflection of what makes you tick. And just pause to consider: do you think a poll of Peak Prosperity or Do the Math readers would show a correlation or strong preference for astrological sign or birth month? When any type classification scheme produces such dramatic results as we see above, there must be something “real” to the scheme—even if you do not understand what it is. The fact that so many scientists are INTJs is no accident. Personality type matters, and often manifests very early in life. The Wikipedia page has some stats on the prevalence of the 16 types in the U.S. population, as well as some temperament labels. Other sites have their own labels; the table below provides some synthesis. For full disclosure, I tweaked the high end of the ISTJ and ISFJ ranges by 1% each so that the sum of average values would come out to 100%. In the “adopted prevalence” column, I put two numbers: the first is the average of the range shown in the second column, and the other comes from the Truity site (which also has gender breakdown). So I put up a survey invitation on Do the Math to see if the Peak Prosperity result held up. I wanted to make the survey super-simple (one question with 16 drop-down choices), but one day and hundreds of responses later, I came to wish that I had asked a couple more questions (Did you already know your MB type? ; Do you subscribe to the cautionary message?). So I made another appeal and had 230 do-overs plus about 500 new respondents for a total of 958 (725 in total responded to the second poll with additional questions). There are no statistical alarm bells in comparing the two sets of responses, so I present the combined data set here. Here is the result, plotted on top of the prevalence data (Wikipedia in red, Truity in blue, overlap appears purple). Do the Math respondents (958): looks nothing like the overall population! Pretty much the same story as in the original Peak Prosperity poll. The main difference is that DtM lacks as many INFJ as PP. Maybe DtM’s analytic, quantitative bent selects T over F people somewhat more. But in any case, note that the DtM personality distribution and the general population look nothing alike! Look at all that red hair in the audience! Who knew drill bits were so exclusively interesting to that crowd? Okay, now that we have some of the basics about types and prevalence under our collective belt, and have seen the Do the Math data, let’s assess what the results mean. INTJ represented 44% of the survey respondents, while only constituting 2–3% of the population. That is, very simply (and to repeat), what is so notable about this result. I still can’t get over it. Playing off of this extreme skew, let’s pretend that 100% of INTJ types would listen to the Do the Math message and take it seriously (persuadable). This group has already shown a predilection: let’s take it to the extreme. Admittedly, this may be opening the barn door too wide, but we’ll see that even this generous assumption results in a very small barn. We can then calculate the interest level in other groups. The following graph helps illustrate the approach I am about to take. Saturating INTJ, we capture only 6.8% of the total population! In this representation, I have plotted the Wikipedia-obtained prevalence in pink. These add to 100%. I overplot the DtM survey response in such a way that the blue line does not overtop the population in any bin. In other words, we can’t gather more of any type than exist in society. Not surprisingly, the wildly over-represented INTJ type sets the limit on saturation. Setting the two distributions to be equal for INTJ is equivalent to claiming that 100% of INTJs are potential adherents to Do the Math (that they would all be natural followers/listeners to the cautionary message). Again, this is likely an overstatement. But here’s where it gets interesting, in two ways. First, add all the DtM people up on this scale and now we only get 6.8% of the population. That’s a bit less than the 8% I get when I do the same thing using the Peak Prosperity results. This number becomes 4.5% if I use the Truity prevalence numbers. So it’s in the 5–6% ballpark. The second interesting thing is that we can determine the interest level of other types (scaled to 100% for INTJ: reduce all numbers if this is not accurate). Looking at the plot above, we can see that INTP is about 40% represented, INFJ is maybe 25% represented, and down from there. So here is a plot of deduced interest level for the two sets of prevalence data (same color scheme as before). 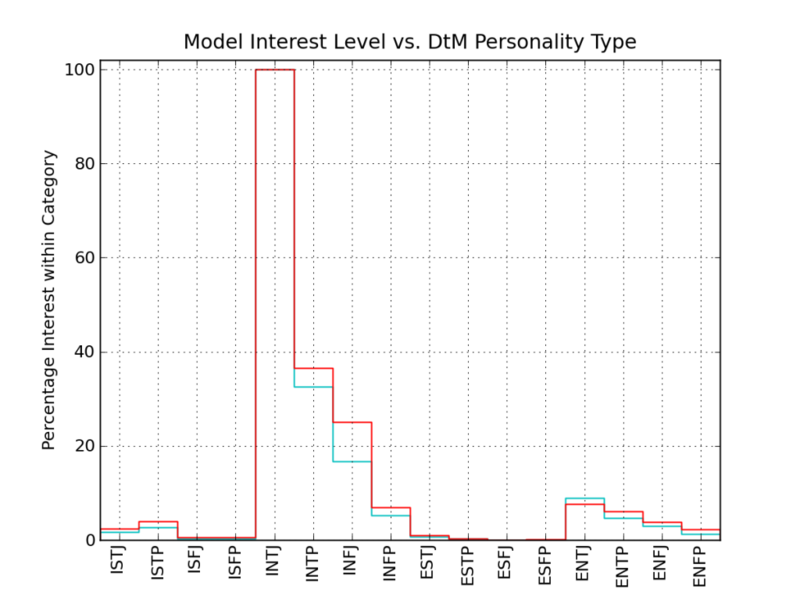 Interest level in DtM as function of type, if INTJs are 100% interested, for two prevalence models. Where did ESXX go? And ISFX? Remember, this is all normalized to the assumption that 100% of INTJs could get on board. To the extent this is not true, the number in the total population goes down as well. The result is noteworthy. Even if off by a factor of two due to some systematic problem (explored below), the upshot is that we probably don’t have a high enough fraction of people with the disposition to take the cautionary message seriously, in advance of evident crisis. If 5% is too low to be a critical mass (as I suspect it is), then this could spell our doom: human nature is not up to the challenge. Cassandra—while being right in the end—is invoked as a label of unjustified alarmism. “Crying wolf” is used to indicate empty warnings, even though the wolf in the story did come in the end. Isn’t it telling, the lesson we take away from these stories? Rather than conclude that we should always examine warnings (the consequences are bad), we create labels to admonish the purveyors of alarm. If the cautionary message is way off base, then perhaps it’s just as well that the adherents never reach critical mass—though I’m not sure what damage would result from an aggressive campaign to reduce depletion of fossil fuels and other resources, other than economic slowdown/reversal. Of course if you buy into the utopian dream this is criminal enough—depriving countless individuals of comfort and easy-living. Well, no. I’m not calling what I’m doing here “science.” It’s analysis, based on a couple of selective sets of survey data. It’s interesting. It has a significant chance of being right, guided by some intuition I’ll discuss in a bit. At the very least it seems to be something we should pay attention to, and if nothing else try to do a more controlled scientific study. I think it’s important. If humans as a whole are wired not to plan far ahead for contingencies of a sort never before seen, then we should know this about ourselves and acknowledge a fundamental vulnerability (other suitable words here are: shortcoming; liability; blind-spot). Could something be wrong with the data? My first exposure to this amazing skew was via the Peak Prosperity forum survey for which I had no personal knowledge of the source and methods employed: was there a link to take a MB type test in case it wasn’t already known? Were we just seeing a reflection of who already knew their types, and the INTX folks really go in for this sort of thing? Do INTX people love taking surveys (I don’t, particularly)? The result was so striking I also contemplated the possibility that it was fabricated to make a point. I didn’t really think so, but could not truly say. This is why I took on the survey myself. In doing so, I know the audience (Do the Math readers who like the site well enough that either they set up notifications for new posts, or dedicated individuals who check in periodically for increasingly rare posts). I also know that I provided a link to a test in case people didn’t already know their type. I saw the same pattern emerge (though with markedly less INFJ), but still had doubts. Was I still just getting people who already knew their type? So a couple days later I put up a new survey to supersede the original, adding two questions: Did you already know your type before taking the DtM poll? ; and essentially: Do you subscribe to the DtM cautionary message? I had 463 responses to the first type-only survey. Via the second survey (725 responses), I found that about 35% of people already knew their MB personality type, but no evidence that this was responsible for overstocking INTJ responses. The only statistically significant deviations from the typical level were that INTPs tend to know who they are, and INFJs don’t. None of the other deviations (shown below) have the numbers to be differentiable from random. Previous familiarity with MB type; number of respondents of each type are indicated across the bottom. The other thing I found was that 76% of respondents agreed with the statement: “I worry that we risk systemic failure if we don’t acknowledge limits to resources and growth.” A small 6% opted for the statement: “Human innovation and economic markets will avert any collapse scenario.” 18% said that neither statement captured them well. I did not see compelling evidence that the optimist camp tends toward certain types (although ISTJ almost stands out here). Note, however, that most types are not well represented in this poll: the non-INTX types are oddball outliers among their fellow types as DtM visitors, so it is risky to draw conclusions about the attitudes of non-INTX folks with respect to the cautionary message. The only statistically significant anomalies are that INTPs are less likely to be pinned down (26% rejected both statements), and 17% of ISTJs liked the optimist answer. Various selection effects could be operating here to skew the PP and DtM results so markedly. Maybe INTJs, being analytical creatures, are more likely to know about Myers-Briggs and know their personality type. I did (but the result described above does not bear this out). Maybe INTJs were more likely to see value in responding to the survey. Maybe INTJs are more likely to participate in online forums of any type. Maybe the way word spreads about online forums involves consort selection effects like co-workers, where correlations exist (I, for instance have no shortage of INTJ types around me at work). Maybe all these things are playing a role at once. I’m sure some of these effects are distorting the numbers. But is it a whole factor of two? Three, even? Even at this level, we still have < 20% of people on board with the message (again under the unlikely assumption all INTJs would be). My sense is that this still fails to meet critical mass for large-scale action in a non-crisis democracy, any way we slice it. Being an INTJ, I rely more on intuition and abstraction than on what I sense around me in the here-and-now. Scientists must do so in order to develop theoretical frameworks. I have a healthy appreciation for the concrete (experimentalist in me), but do still lean on abstraction. I have noticed that I tend to generalize situations looking for the common lesson. I like to synthesize. It’s the distilled product that sticks with me in long term memory. I am prone to make a statement based on a wide variety of inputs over the years, but when challenged to cite specific examples, I struggle to recreate them: I’ve already chucked them out in favor of the overarching principle. The sensing/intuiting split is the most crucial personality component in the present context, although thinking/feeling is a very important dimension as well. In order to project current practices into the future and recognize a peril that does not look very much like the world generations have known requires abstraction (and thinking), rather than sensing the immediate world. So N types are most likely to heed the cautionary message. Look again at the “interest” figure and this bears out extremely well. I don’t see that as an accident. According to the prevalence data, S types constitute 69–73% of people. That’s a lot! And look at how non-represented they are on the “interest” plot. We’re missing most of the people. This is part of why it is also so difficult to get people on board with global warming messages. Thinkers are more common, though still in the minority, at 40–47%. So it’s the S/N characteristic that’s the bottleneck. Even if the survey was deeply flawed, such that in reality 20% of S-types were responsive to the cautionary message (as opposed to 1% reported) and as many as 50% of the N-Types, on average, were receptive (twice as large as shown), we would still have less than 30% representation. And this is a pretty severe systematic distortion of the poll. If 100% of N-types are receptive and 0% of S-types, we’re also at 30%. It is hard to imagine selection effects being so completely slanted toward INTJ that these distortions would be allowable. And if this were the case, we would be forced to put even more stock in the usefulness/meaningfulness of personality types. In summary, if you base your world view on concrete, “provable” facts sitting in plain sight, then you’ll have little truck with future extrapolations and musings. The more radically the projection departs from the “normal,” the less likely it can be taken seriously. These are good, solid traits for humans to have—and we can imagine their merit in an evolutionary sense. Things usually are as they are and have been throughout living memory. Except when they’re not. One other dimension worth poking: what if, for instance, an ENTJ is every bit as likely to be persuaded to heed the cautionary message as an INTJ, except they spend their time socializing (in person or virtually) rather than reclusively reading scary websites? What if they could be brought on board? Indeed, the interest level among ENXX types somewhat mirrors the descending staircase seen in the INXX group in the Interest Level plot. 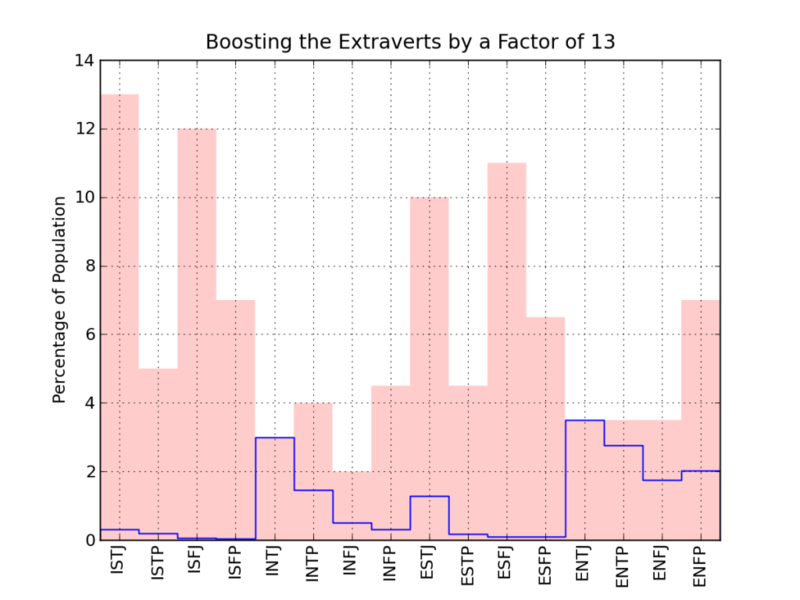 What if the extraverts were boosted (by a factor of 13, it turns out) so that 100% of ENTJs would be receptive? The result is in the extravert-tweaked figure below, using the (more generous) Wikipedia-obtained prevalence numbers. The Party’s Over: getting the extraverts’ attention still results in a small total yield. Welcome aboard, party people! Now we are 11–18% of the population, depending on prevalence numbers—up from 4.5–6.8% when you were busy socializing. Hmm. Still not an impressive showing. Still sub-critical—even if this distortion/boost is justified. As stated at the beginning, my impetus for all the Do the Math work was to lay out a rational, quantitative foundation for why we should not take future growth/wealth/happiness for granted. We could really blow this thing. Our best hope, as I saw it, was to get people to acknowledge and accept the threat and thereby endeavor to make it go away. As with any 12-step program, admitting that there is a problem is step one. Failure to acknowledge what, to me, is a wholly plausible set of major concerns triggers a strong reaction on my part. How can we mitigate what we don’t acknowledge? Failure to acknowledge the risk serves only to solidify the likelihood of the risk, in my mind. Perversely, calling me wrong outright probably makes me more right. Saying I might be wrong, or even that I am probably wrong while admitting some chance of my being on target and acknowledging the enormity if so is just fine by me. This personality analysis helps me understand the scope of the challenge. It mostly serves to reinforce my concern. It seems we have a built-in impediment to preventive mitigation for unprecedented crises. At some level, it just makes me feel resigned: no hope in politicians, now no hope in human nature. But as a cerebral type, it gives me some satisfaction to have insight into how and why we may fail. If the world falls apart before I die, at least I’ll have some inkling as to what’s going on, and won’t be as psychologically shattered by the affair. But I’ll be one of a pitifully small number, I’m afraid. This entry was posted in Behavior, Sociology and tagged data, psychology by tmurphy. Bookmark the permalink. There is very little in this world that is funnier than a rational, well-trained scientist falling for mumbo jumbo. Clearly, confirmation bias isn’t exclusive to the kooks. Hmmm. A comment 10 minutes after posting. I’m going to guess this is a knee-jerk reaction to perceived nonsense and not a careful assessment after reading the content. A rational person absorbing the dramatic INTJ skew would have to acknowledge some “real” quality to the personality types. This is convincingly far from voodoo, astrology, or speaking to the dead beyond the grave. I’m also guessing this commenter has no survey evidence of his own to counter. And by the way, I’ll suppress further reactionary, inattentive comments (from anyone). Tom – you deserved every bit of that snark. Some of us aren’t as new to this subject as you appear to be. You’ve stepped outside of your area of expertise, ignored the clear problems with the theory you chose to apply, and proceeded to interpret your result in exactly the fashion that broken ruler you used was intended to produce. No discussion of plausibility, no caveats about the lack of predictive results from MBI analysis. Your data may have something (fairly obvious) to say about how people who like a thing tend to have things in common, but the rest is speculation at best. Okay–this is more constructive and I appreciate that. The simple fact that DtM is highly selective for INTX is itself a very interesting (even if obvious to some) result. Does it not say that a small fraction of the population is attracted to DtM? Isn’t that significant? It tells me that I can’t expect a site like DtM to reach much of the population: they self-select away from the message/style. I value that knowledge, and wanted to share it (to that small slice attracted to DtM). It might not be the message itself, but how it’s presented. Of course you’re going to find plenty of us INTXs reading a blog chock-full of graphs, what-if scenarios and thoughtful extrapolations. The subject itself is of little importance. If you really want to reach the ESXX crowd, you should probably look at WWF’s Earth Hour, SXSW’s sustainability “focus”… basically, messages and/or promotional actions that don’t ever register as blips on our radars, that we usually deem empty, ineffectual or even counterproductive, might be just what touches them, in their cutesy little way of “understanding” things. My thoughts exactly! Would a typical ESXX would sit through that many graphs? I think an ESFP, for example, would be more interested in political organizing, not Doing the Math. I don’t think the message is the issue; it’s the medium. MTBI types aren’t determined by political leanings, but by how you interact with people and information. 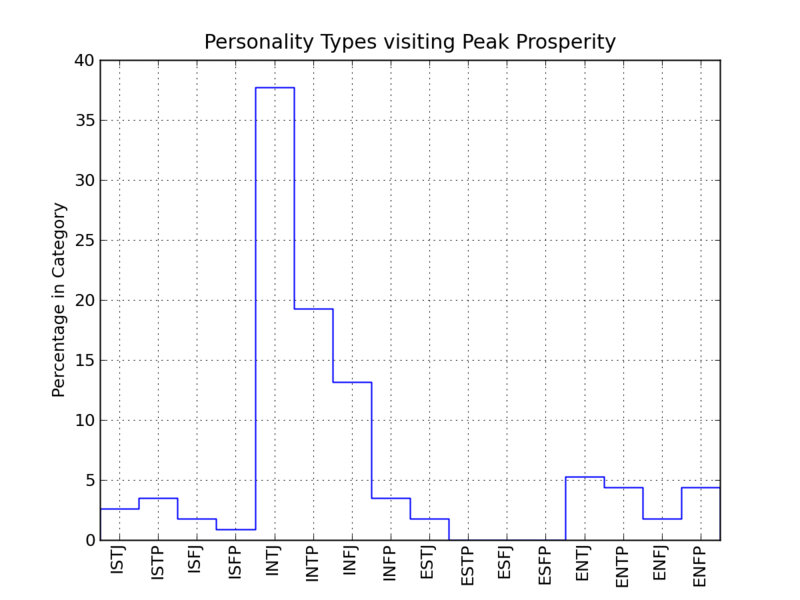 That said, as an INTP, I think Do the Math should keep the graphs coming. There are plenty of media appealing to the sensing-feeling types out there. Btw, upon re-reading, I would like to state for the record that I don’t agree with your last comment, Gus. I think that all ways of understanding the world are equally valid and we need all personality types on board to move the world forward in a productive way. Personally, I just feel that graphs are fun, and it is important that we all are conscious of our own biases related to the media we choose to consume and how we filter that information. I know that’s a little condescending, but so is putting quotes around “understanding”. That was merely a joke based on the prejudiced view that INTXs are supposed to view themselves as superior, coupled with the heavy demographic skew shown by the post. Arguably not a good joke, nevertheless not meant in earnest at all. Very interesting. I’d always been a bit sceptical of MB but this is quite striking. I can think of quite a few websites of the cornucopian / climate sceptic variety which I dip into from time to time where I’d be fascinated to see the same analysis done. I think that your assessment about what is a critical mass for society to earnestly come to grips with the problem of resource limits is pessimistic. If you conceive of it in terms of 50% + 1 a la some sort of democratic referendum on the matter, then sure: taking the highest estimate, 20% is nowhere near enough. But, continuing on the democratic theme, if you take, say, somewhere around 10%, then you have a very large interest group that political parties have to consider, especially if you factor in the fact that most elections are decided by a relatively small number of swing voters (given entrenched voting patterns in the electorate). And, sure, your data doesn’t necessarily suggest that 10% is the number to go with. Say the number is more like 2-3%. These are the people that can quite readily be translated into evangelists for the awareness about the problem of resource limits. Using their efforts and, er, resources, the number of people that may then take on the message can increase by a factor of four or five after a sustained and organised campaign. There’s obviously challenges in such a campaign. The main one I can think of is the difficulty of converting the quantitative analysis present here and elsewhere into a message that can be readily communicated. Take a parallel example: the “We are the 99%” slogan. This slogan essentially points to dissatisfaction with vast income inequality in society, where the rich get richer of the backs of the poor who get poorer. The analysis of this phenomenon is quite complex; yet there’s a fantastic distillation in that slogan. I’m not saying that a slogan is the key ingredient here; I’m just using it as an example of the necessity of communication. In fact, I’d suggest that this may be skewing your data. It may be the case that your survey pings high for INTJs (including me, by the way) not because of the nature of the message but because particular personality types don’t engage well with the style of the messaging. Maybe ESFX types (I think that’s the right schema for the lowest engagement per your data) just don’t engage with *any* quantitative analysis or extrapolative abstraction as is present on this blog. But thats not to say that the message here is impossible to communicate to those types; the work simply needs to be done to find styles of communication that will work. A few final comments: 1. The unwritten caveat here is “for the countries that your readership come from”. It may be the case that different cultures fail to map to MBTIs in the same way as Westerners or it may be such that non-Western citizens do tend to grapple more with these questions and there is something peculiar to the West that creates—in combination with your MBTI results—a failure to engage. 2. I’ve always enjoyed your blog from close to the very beginning and always read your posts (though for some reason my email notifications haven’t come through for a while till this post). I make an effort to share it across my social media networks every six months or so. Response rate isn’t too high; but that’s endemic to any content on social media that isn’t a funny cat picture. Why do you assume the only way to get anything done is to try to calmly and logically convince people that it’s a good idea? Perhaps your blog gets a large amount INTJs because those kinds of methods are very effective for that subclass, but ineffective at convincing other classes? This seems to imply that are other techniques that would work on other types of people, but would seem foreign or unconvincing to you. It then follows that if the fate of the world is at stake then it might be wise to try and understand these other techniques and put them into practice. If you are not able yourself, then find someone who is and get them to work for you. I hear giving them money is effective at this. What doesn’t seem like it would be very effective is writing that, since your preferred method of convincing doesn’t easily work, the world must be doomed. After all, saving the world is supposed to be an easy thing you do on your off hours right? That was sarcastic, but come on! You’re a scientist, when something doesn’t work you keep trying until it does (or you understand why it isn’t working, so you can do something that will). You don’t just give up and assume that its too hard. The fact that there might be bigger impacts then just your career doesn’t change that. There are ways of getting people to do what you want that don’t require them to think exactly like you do. This is trivially true! If there wasn’t, how could anything ever get done on a societal level to begin with? Study those ways with the same eye you use to study the moon. Figure out how they work, why they work, and use them to your advantage. It’s really no different to studying the nonhuman realities you’re already comfortable with. Understand the world, understand what you can do in it, then do it. Don’t whine on your blog that it’s too hard to reach people. Oh and if like Myers-Briggs personality stuff, check out http://personalityjunkie.com. It’s pretty good. I am INTP, i knew that going in. I selected ““Human innovation and economic markets will avert any collapse scenario.” but only reluctantly. I was going to select neither as i feel your options were too absolute, neither of them describing what i believe very well, but the Human innovation one was closer. comfort and easy-living? Thats what you think this is about? According to the UN, something like 800 million people are malnourished, 3.1 million children die each year from poor nutrition. And thats *just* food, im not even mentioning little things like clean water, access to health care, infrastructure and many many other things that save peoples lives. This isnt about “comfort and easy-living” its about giving a huge number of people a tiny fraction of what you take for granted every day. You may well be right, we may be heading to a catastrophic future if we dont change, but you would do well to at least acknowledge that the risks if you are wrong are substantially higher than mere comfort. Point taken. I did not intend to diminish the plight of most humans. As long as we believe in continued growth, the greedy goats will say the downtrodden have that to look forward to, and need not consider redistribution. Maybe it is cool to be an INTJ so why not be cool on the survay? A lot of the climate change denialists (people who actively try to disprove climate change, not merely people who are agnostic or opposed to it) I see online seem to be engineers. Typically, Engineers tend to be NTJ and NTP-types. I’d actually be very interested to see what kind of distribution you’d get if you ran the same poll on a similar blog with a drastically opposite message. michiel, that’s an interesting point. I went to a presentation, put on by a friend, about economic collapse. There were a couple of naysayers in the audience, and one could probably be described as INTJ. He strongly defended the Federal Reserve and the idea of money, for whatever reason…. (he said he remembers being “a fan of the Fed” since he was 10). I’m an INTJ, and frequented lots of that sort of folk in college. An acquaintance went on to post-doctorate work in biology and for many years now has run laboratories at MIT and Tufts. Yet he plans to have his head frozen. Leaving aside the question of whether a head transplant would be either possible or desirable.. he doesn’t seem to have taken into account the likelihood, rather, that Froz-n-Heads-R-Us would run out of ready cash to man the freezers and would most likely opt to dump the body parts out back near the chain-link fence. Who’s going to complain, exactly? Sometimes INTJs have a hard time understanding human nature, which has the capacity for throwing a monkey wrench into their perfect schemes. I too have reached the same conclusion you have Tom; too little will be done too late, if at all. As you mention, the critical mass required has not been reached and may well never be. I don’t think your final verdict should be resignation. You are obviously speaking to a wide audience, and you are particularly successful at speaking to other scientist types. I wonder how many of your readers see the risk of systemic failure if we don’t acknowledge limits to resources and growth BECAUSE they read your work? Just a hunch, but I bet a lot of the personality types who are not interested in DtM (whatever the reason), but who are aware of the risk of systemic failure, are doing real-world activism. KXL Pipeline, Utah tar sands, fast food strikers, etc. There is a huge portion of the population that is working two or three jobs just to survive and probably don’t have the time or education level to read your blog. While they might not understand all the intricacies and math behind their causes, they just know that something is wrong and if they don’t act things will get worse. Anecdotally, the most frustrating people for me to talk to about the ideas expressed in DtM are college educated people who live in a comfortable bubble (for now). They tend to be fragile people who haven’t been affected as much by harsh realities of inequality. They tend to have great concern for the poor and afflicted classes of people, but either expect the victim to change their own lot in life (“pull yourself up by the bootstraps”), or the system to fix the problem via more legislation, more welfare, taxes, etc. They don’t (or won’t) see the hypocrisy in that. Working class people can be frustrating to talk to because they tend to target their anger at the wrong groups of people, but at least I can have a real conversation with them about these topics that worry me. ENTJ here, but BARELY scraped into E territory. I think your results are why most in the movement are accepting that calm rational explanation of the predicament just ain’t gonna cut it in any way. Those of us that “get it” blather back and forth to each other on these sites, meanwhile the real world, that sees the world very differently, just carries on. I know who I can send to DtM to drive the point home, and who I just can’t. But there ARE other methods to make the point other than your (brilliantly rendered) one. Let’s hope some of them can generate some success. Speaking as an INTJ, engineer, inventor, technologist and an “I worry that we risk systemic failure if we do not acknowledge limits to resources and growth” respondant, I observe that we already have sufficient technology to avoid systemic risk which we are not implementing if only we were to practice a little self-discipline or self-control as Elizabeth Kolbert recommends. Also, while I’m sure bonewah is sincere, Tom is correct that we avoid both the problems and the solutions because we do not want to compromise our comfort. Feeding the poor has nothing to do with the profit motive. The last person who made this argument to me was driving an SUV. I pointed out if he drove a smart car instead that some of that fossil fuel could be used by a poor farmer in Africa to plow his land or pump water from his well for irrigation. My friend would only be giving up a bit of bling and maybe a little comfort. I think this study of your’s is publishable. It may be raw and need a little work but it is as good as a lot of biomedical and cognitive psychological studies I see. If this informal survey correctly judges the problems we face, then my only hope would be that downshifting and constricting economic realities take place slowly, maybe a step at a time. That way enough ‘here and now’ evidence might accumulate for the sensing types to agree that there is a problem and that the chances that the problem is grave are high enough, so that a critical mass develops. Unhappily, looking over past times when civilizations fell, that never seems to have been the case. Wow, this is a very interesting result! I always thought these MB-types were pretty soft factors mainly to tweak/personalize a presentation or sales pitch bit this data is the hardest evidence I have seen that these types have hard predictive value. Too bad that the conclusion for human society turns out to be rather negative. I had already thought that this blog had little new things to tell any more but this blog post was a nice positive surprise. P.S. : I would describe myself as a ENTJ. P.P.S. : I am not checking your website every day. I have subscribed to this site with my RSS reader. Not as dedicated as you might think. I’d want to see numbers on RSS reader users before I drew anything at all from this. Websurfing habits and techniques seem more likely to correlate Myers-Briggs as the receptiveness to a particular set of ideas. Also tolerance for economics: many people just glaze over immediately. Even if we set that aside, I would expect it to be about your writing style as much as your message. I mean, of course anyone who can get through your posts is going to be analytical: you tend to bury your lede under a pile of data. Receptiveness to apocalyptic ideas, however, is definitely a widespread human characteristic. The same message could definitely be communicated in other styles: Global warming is now accepted by lots of people who would never have the patience to pore over the (fascinating!) details of how we piece together climate history data: if anything, a lot of overly analytic people were slower on global warming, because they needed to see the math, as it were. If this becomes a fashionable end-of-the-world to worry about, it will get it’s moment in the sun. At any given point of history, there’s a whole host of dooms being worried about, religious and secular. When I was a kid it was nuclear war. The secular crowd has mostly moved on to climate change now, in time it will shift again. But there will always be something, everyone always wants to know how it’s going to end. Another thing your readers do is write very long comments without sufficient punctuation. You may not be familiar with the history of this movement. It was already fashionable. It already had its moment in the sun, years ago. Back in 2006, peak oilers and energy decliners were predicting the imminent collapse of civilization. Back then, they managed to convince tens of thousands of people to prepare for doomsday. They even got major media attention. They were featured prominently in Harper’s magazine, the Atlantic Monthly, the Wall St Journal, and the NY Times (Sunday supplement). That’s some serious publicity. Also, they got a Congressman on their side (Roscoe Bartlett, the only physicist in Congress). I think he formed some kind of congressional task force or committee or something. This stuff started to fade around 2009. It’s hard to preach imminent catastrophe for that long. They got their moment in the sun. They won’t get another. Apocalyptic groups usually only get one moment in the sun. That’s not what I meant. I meant these people and this group won’t have another moment in the sun. People like Colin Campbell, Matt Savinar and Gail the Actuary are obscure forevermore, most likely, just like the Technocracy movement never got another look. Hubbert curves are probably gone for good, too. Certainly, the idea of imminent resource scarcity and collapse will recur. That idea has cropped up over and over: there were movements at the end of the 19th century, the 1920s (the conservationists), the 1930s (the technocracy movement), the 1970s (as you pointed out), and the 2000s (peak oilers). Yes, Tom S.. there have in the past been rabbits pulled out of hats: in the 18th c. Westerners went out and annexed land and resources that allowed their Ponzi schemes to expand. Similarly, in the 1970s Nixon paved the way for capitalism (having run out of road) to annex China. The 1980s saw injections of fossil fuel via the North Sea and Alaska’s North Slope.. what of it? These perturbations—what appear to be new leases on life—don’t negate the larger trend, which is one of decreasing energy availability per capita and decreasing arable land/soil per capita. Make a $#!+load of fossil-fuel-based fertilizer, pour it on sterile soil, run a combine over it that weighs 50,000#, and get a harvest for one more year. Do you really think these activities can continue to expand infinitely and exponentially? Since it is Intuitively Obvious they cannot, then at some point they will cease. The moment in the sun is now, and it is a very glaring moment indeed. The very fact that our “salvation” would apparently on mental defectives like Branson, Musk and other who see the future in our acceding to other planets, at the same time we are not able to keep the roads paved on Terra Ferma…. Q.E.D. .. ya know? They’ll get their moment again of course. Any time the issue of resource scarcity or economic collapse becomes obvious to the average person the popularity of alternative points of view surges. The thing is, in 2006 we were indeed facing the imminent end of civilization as we know it. It did start to collapse in 2008 but was saved in the nick of time by about $12 trillion of money printing lent across the word to stave off cascading bankruptcies. Since then the economic system has been changed to become dependent on free money printed out of nothing. But now, no central bank has credibility anymore and the system will collapse or be completely rebuilt in the not too distant future. That new system will reflect in monetary terms the real world resource limits we believe we have somehow escaped. The thing is, economics and energy/environment are highly interwoven disciplines and you can’t seriously analyse one without incorporating the other. The shale oil boom was never profitable and was only possible as a result of all those trillions of printed $ funding yet another ponzi scheme. That fact is now apparent with the engineered drop in oil price which has popped the scheme. Doomers have been predicting imminent catastrophe for a long time now. It never seems to materialize. Is that because we aren’t facing imminent catastrophe, or is it because the authorities keep pulling rabbits out of their hats to extend the game a little longer? In the US in the 1970’s, that rabbit was the US military which enforced for over 40 years the dollar as the world’s reserve currency, which enabled the US to consume the rest of the world’s oil (which wasn’t at Peak yet) to offset its own declines. Otherwise, the US would have collapsed decades ago. Now, that game is nearing its end and this time there are no other rabbits to pull out; the world is at Peak Resources and there is no one left to steal from. Mark, I agree. I didn’t mean to steal the “rabbit” metaphor.. (I should really read the whole thread before jumping in). I’m sorry to say this, but what you’ve written is just pure crackpot pseudoscience. I’ve been following and observing doomsday groups for many years, as a strange hobby. What you’ve written could be repeated verbatim in any other doomsday group. You’re just mired in unfalsifiable thinking. You are repeating all the errors of crackpot pseudoscientific groups. I’m sorry, but that’s just not falsifiable. If every failed prediction is met with some explanation afterwards of how the prediction was correct anyway, but some exceptional circumstance averted the doomsday, then the theory is not falsifiable. In that case, it’s not even a valid scientific theory, much less a correct one. In order for a theory to be falsifiable, there has to be some prediction BEFOREHAND of something that was unlikely to happen otherwise (ie it’s a risky prediction), where a failure of the prediction implies that the theory is WRONG. That is what falsifiability means. That is the first step toward a valid scientific theory. Since nothing like that has ever happened in the energy decline community, their theories fail the most basic criterion of science and are pseudoscience. The larger trend is not one of declining energy availability per capita worldwide. Nor is there a decline of food calories per capita worldwide. Quite the opposite has happened in both cases. There may be a decline in cropland but that’s because of increases in agricultural yields per hectare. Also, if you’re claiming there’s some “larger trend” where failed predictions don’t count as evidence against it, then there is a problem of falsifiability as I indicated above. In my opinion, there was a big logical leap which happened there. The second statement does not follow from the first. Even if something can’t expand exponentially to infinity, there’s still an extremely wide range of possible outcomes other than imminent collapse. That just doesn’t follow, in my opinion, and definitely not with the kind of certainty that would warrant a “Q.E.D.” at the end of it. The roads are in bad condition because of political changes which have shrunk the role of government, and especially have shrunk the fraction of government revenues devoted to physical infrastructure. That’s no evidence one way or the other for peak oil collapse. Doomers are certainly not strawmen. Tens of thousands of people were preparing for imminent doomsday back in 2007 or so. A few doomers are here. The long decline is the unfalsifiable version when the original predictions have failed. In many ways, the “long decline” is LESS falsifiable than the fast collapse which Matt Savinar was talking about back in 2005. As least the fast collapse was a specific and risky prediction of things that weren’t happening otherwise. It had clear criteria for falsification. In contrast, the long decline lacks either of those things and so is less scientific in many ways. The problem with the long decline is that you don’t know if it’s happening or not. As a result, people rely on things like financial panics which happen routinely anyway and aren’t evidence one way or the other. The “long decline” was proposed recently by people who were around during the energy doomsday theories of the late 1970s and early 1980s (this stuff is actually old). Presumably, they realize that civilization did not collapse back then as expected. Now they are talking about a “slow collapse” instead. That is a textbook case of unfalsifiability: they responded to wrong predictions by modifying the theory so it has no predictions. Very interesting but not so surprising. I have long thought that personality type (whether MBTI or more current academic psychology models) is very important in this. Yes, we need different communication styles for different types (I’m probably ENTP). Some people need a vision of a positive future to work towards. Others need physical evidence. Putting aside any discussions about the merit and usefulness of the MBTI – I, as an INTP and faced with a lot of INTJ-type reasoning on DtM find that the discussions are rooted in linear extrapolations of today’s technologies, and not the exponential potential of future technologies. It is hubris to think that we can predict with any certainty what the future will look like in 10 years let alone 50 or 100. Venter’s genetically engineered oil-producing microbes, Drexler’s nanotechnology, or Musk’s next Big Idea, are more likely to bootstrap us into energy abundance than any careful extrapolation of the limits of current technology with a good dose of conservation. Singularity or bust! Of course this could be an INTP “cop-out” passing the responsibility for fixing the EXXP politician-created mess off to the INTJ’s here. Why is nanotechnology “likely to bootstrap us into abundance”, rather than being “likely to poison us and the majority of other beings in manners which we are not even prepared to examine”*?? *as nukes and GMOs and statins have done, for example. ENFP according to the survey you referenced, which surprised the heck out of me. Also an RSS user. I started reading because I was getting deadly tired of not having good data and analysis to work with; the few times over the years that I’ve been able to check popular-ish reporting against hard facts, it’s often been dead wrong, and usually been completely innumerate. In roughly the last decade I’ve become more and more suspicious of being spun and more and more interested in checking claims against hard data. I’m afraid that the best we can hope for is that solar/wind/storage will get cheap enough to compete with fossil fuels, and “we” will just have to suffer through whatever warming is already baked in. I think that all the people who make money off of burning fossil fuels will be incredibly difficult to convince, no matter what personality type they happen to be. I was at a short presentation yesterday from someone in the “deep thinker” group at the US EPA Office of Air and Radiation; the ones actually doing something about climate change. This was on the transportation sector, and I thought to myself watching the presentation, “You’re not producing fast enough emission reductions, you’re relying on cellulosic ethanol which doesn’t really exist, you’re ignoring the possibilities of passenger rail that Europe uses extensively, and you’re ignoring the possibilities of non-motorized that most of the rest of the world uses more than the US.” No, I didn’t say anything. Because you’re right, absent a large, obvious climate signal, or a large, unignorable fossil fuel price signal, people are just going to do whatever’s easiest/cheapest. But there is no such thing as “renewable energy”, either in the “artificial” man-made world or the “natural” world. What we call “renewable energy” cannot be separated from massive fossil-fuelled investments in mining (limited) rare-earths and creating the steel and glass components of the infrastructure. The vast majority of components of an electric car are identical to those of a gasoline-powered car: the body, the glass, the foam and polyester seats, the plastic “cabin”, the tires.. the roadways! If climate change doesn’t get us first, all today’s “renewable energy” infrastructure will be in the landfill in 30-50 years along with the DEC Rainbow computers, 8-track tapes, and Atari game cartridges. The devices that are used to capture the sun and wind’s energy are an extension of the fossil fuel supply system. I realize you’ve vowed never to respond to my posts again, and I respect that. However, there’s a wider discussion happening here so I hope you don’t mind if I post something as part of that. Yes, but the green sources of electricity and transportation use far LESS fossil fuels than the electricity and transportation we use now. They aren’t just equivalent. For example, wind capturing devices have an ERoEI of 16, so less than 1/16th of the electricity from those devices comes indirectly from fossil fuels. Of course we’d still need fossil fuel backup, but only sometimes. If we’re using only 1/16th of the fossil fuels to generate electricity from a wind turbine, then we can use the fossil fuels we saved thereby for other purposes instead. For example, we could use the natural gas saved as fuel for mining equipment to build more wind turbines. Couldn’t we drag out the usage of fossil fuels for at least 50 years thereby? Isn’t that enough time to transition the supporting infrastructure you mentioned (like mining equipment) also to renewables? After all, there are many different kinds of synthetic liquid fuels which are synthesized using renewable power, and which could be used for applications (such as mining equipment) that are difficult to electrify directly. Why don’t we transition the easy things first and use the saved fossil fuels to transition the harder things later? I’m afraid I just don’t see how this problem presents any kind of insoluble technological or organizational difficulties. Does the EROEI of wind go up every time a wind turbine topples over, throws a blade, catches on fire, gets dirty, ices up, rams through a house during transport, or needs maintenance by helicopter? An interesting question to me is why you thought there was hope: it has long seemed obvious to me that, as a civilisation (I’m not going to say ‘as a species’ because that seems too, well, genetic a claim) we manifestly are not up to dealing with the problem. Everywhere you look there are people who think that extrapolating exponential processes indefinitely is Just Fine, and these people are not some fringe group, they are economists and politicians (and computer scientists, worryingly). Well, obviously it’s not fine unless those processes have no physical component (currency inflation is a nearly canonical example). But for whatever reason (I’ve always assumed a combination of innumeracy, greed and cowardice) this is what we are meant to believe is OK: this is what they teach you if you do an economics degree. It has never seemed likely to me that more than a small minority would understand that it is, in fact, not fine at all. And a small minority is not enough. I’m another already-knew-he-was INTJ (verging on INFJ) who is more than a little skeptical of M-B. Pretty sure fossil fuels are going to run out in the sense that we’ll use them far differently (and much less) in 100 years than we do today. Not confident about predicting whether civilization goes boom in the process, or perhaps alternative energy and cultural change accomplish a lot of mitigation. We DO adapt, but on time scales that may prove longer than the time available. I am INFJ, and recently applying JMG solution to our predicament: collapse now and avoid the rush. I can’t see any other way. I compare our modern world to the Titanic. Just before midnight, only 2 persons (captain Smith and Thomas Andrews), out of 2200, know that the ship will sink. But I bet that had it been not that late most passengers would still have been demanding their Zakuskis. At the beginning, most passengers are reluctants to board the lifeboats, they don’t believe that the ship will sink. But when the water starts to submerge the bow of the ship, evacuation speeds up. It tells us that people need to see things before they actually act. And from Susan Krumdieck’s bacteria I learned that currently people can’t “see” our problem of energy and natural resources. The media don’t help. And many blogs I read come up with splendid projects without asking the nr 1 question: with what energy? So it’s fine to keep trying, and I do that, but I am also collapsing right now. As John Michael Greer states it, I am picking up the skills and -above all- the tools right now, while there is still time to do it competently. I enjoyed the article quite a bit and like this kinda thing. One thing that could be skewing the numbers a bit, is that INTx tend to gravitate towards other INTx. Your writing appeals to me, I don’t agree, but I _like_ it. Because you are using thought… real thought in your work, you _could_ convince me. I think others could be like me and just plain enjoy reading / listening to another _thinker_. 114 self-selected MB reports tell you what? Nothing meaningful. Not disputing your overall concern, but wanting to question whether general fossil fuel assumptions are any restriction on progress away from undue reliance on fossil fuel availability. Assumptions appear to have already changed in your favour, albeit in reliance on dramatic climate change forecasts rather than on comparatively numeric fossil fuel restriction forecasts. If that is correct, the constraint on alternative energy appears to be the scientific and engineering challenges. Personally, my own view on the problems you mention here, tie not just into making the public more aware of these impending problems, but of making the public more aware of economic problems – I have had next to zero progress in the latter, even among very smart/INTx types. To me, Post-Keynesian economic theory, which shows how money creation can be used to fund public projects (while staying within inflation limits – most people shout ‘hyperinflation!’ to this, without understanding how inflation works), is the only way to fund the necessary infrastructural projects and take over enough societal/economic control, to actually implement the policies needed to arrest these impending problems. It (monetary reform of this kind) is also, to me, the single most important democratic and political topic of the past couple of centuries at least – but convincing anybody of this is far more of a difficult challenge, due to how economic theory just makes people switch off completely. I tend to be an alarmist in general (though not regarding to global warming: http://sol-biotech.com/wordpress/2015/04/14/physicists-skeptical-of-global-warming/) and have been boring friends/family with my concerns regarding peak oil, land, ocean, water, etc. for decades, to no avail. Interestingly, during that time I have realized that every one of my predictions has failed to come to pass. I cannot dispute your math, indeed, you have carefully documented my gut feelings (http://sol-system.com/koxenrider/bok/energy_bogey.html), yet the predicted outcome stubbornly refuses to arrive. Much like my zombie fearing relatives (where ‘zombie’ is a shorthand for the starving, wandering hordes driven out of cities by the breakdown of civilization), I not seeing the expected changes to society and get increasingly reluctant to invest in alternative energy infrastructure when the real price of energy keeps dropping. I applaud your decisions/experiments regarding alternatives, but for me the potential money saved does not justify the expense, even for hobby scale, when I keep observing the decreasing (real) price of energy. Still, the analyst in me says that the crash _must_ happen, but when it refuses to do so I am constantly second guessing myself. If my feelings are in any way representative of your readers or of society in general, then your quest to wake us all up is further confounded. As a by the by, I wound up being mostly a INJT (how I responded to your survey) but also with some elements of INFJ. I was also quite surprised at how accurate the descriptions were, though, naturally, it didn’t apply 100%. When the changes you fear come to bear, so long as the delta is within the velocity of forgetfulness, society will adapt – albeit with great consternation and gnashing of teeth. If the delta is outside the velocity, wars will erupt. I think it is safe to say that at some point there will be war. I visit this blog because I am conscientious. I am interested in seeing what I can do to contribute less to the problem. I like to lead by example, even if I have no followers. Individuals may become educated and make personal changes; but there is no amount of education that will ever change Humanity . My husband pointed me to this article. I haven’t read your blog before. I am very interested in personality psychology and am an INFP. What you have said is interesting, but data heavy for me. I don’t tend to put a lot of faith in data, because it can be skewed so easily and have so many factors, that if not thought out completely, may not see the forest through the trees. Humans have a tough time seeing things completely or skew data in their favor, so I don’t put much faith in data. I follow my own common sense. I do not think it’s surprising that so many INTJ’s follow your blog, since you are an INTJ. It’s easier for people to learn from someone who is the same personality type. I do like math though. I have an engineering degree, but have been a stay at home mom for the past 15 years. I am a true blue idealist (NF) and am very concerned for our future and also would like to reach more people. I’ve been realizing lately that some people are followers and it’s part of their personality to be that way; most likely following whatever is most acceptable in our society. Extroverts tend to want to follow more than introverts, because they find safety with others and want to be accepted, while introverts find safety in withdrawing. It makes it easier for introverts to question. 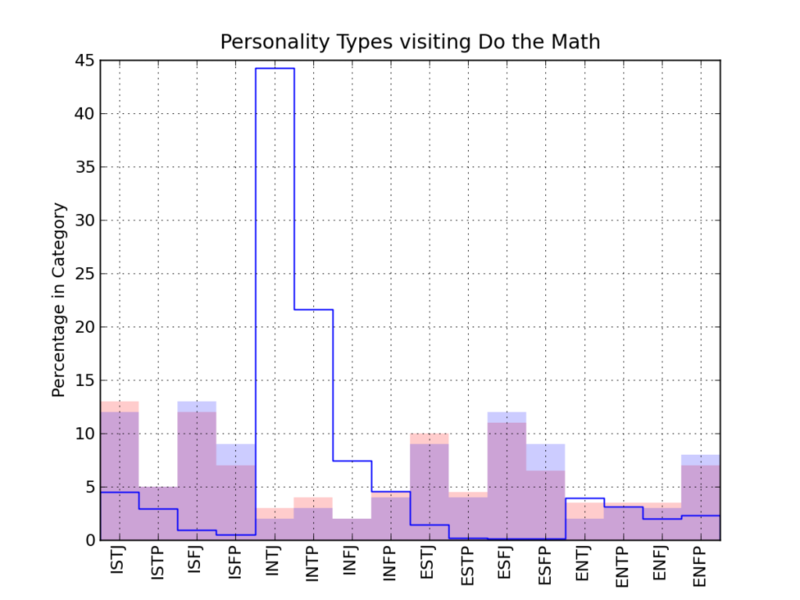 Some extroverts have some introverted characteristics, hence you see some in your data. People aren’t one way or the other here. It’s not black and white and that’s one issue with the MBTI. The sensors (S) don’t tend to question themselves or the ideas they hear. They find data to support what they already believe. So I do believe it’s not possible to reach everyone, as you said. I too want to make the world a better place and I’m not sure how to do that. Right now I have this aching need to understand others and myself, so I follow that. I question everything. The pattern I’ve noticed is that as humans, we go in circles and I don’t think overall we are improving on an emotional level. It’s part of evolution for us to be so different and that hinders us in a way, but if we use compassion and understanding and nonviolent communication (there’s a book on this topic), we might get somewhere. If not, we may cause our own extinction. Too many people who see things short term and use others to get what they want right now. The big picture is important, but how we get people who feel safest burying their heads in the sand, to see it, I’m not sure. We all want to feel safe and we all use different methods to get that need met. > why […] make the seemingly wasted effort to respond to—in their eyes—doomsaying kooks if in fact we need not be concerned? Morale can also be affected. When us scientifically-minded persons say we need not be concerned, we don’t mean we need not be concerned about anything. We mean we need not be concerned about resources and the environment as long as government restricts its role to enforcement of property-rights. When it steps beyond that role, then, yes, we need be concerned — about government. I am an INTJ and an engineer. About 15 years ago, I shifted my career focus to alternative energy, green building design and permaculture. So I take the issues you are discussing very seriously indeed. I am not surprised by your survey results. There seems to be very little appetite in the general population for these sorts of concerns. To me, this reflects evolutionary psychology: humans have been shaped over generations to respond to threats that are immediate, concrete, and visceral (e.g. a tiger, or a rival human). We do not respond very effectively to threats which are abstract and distant in space or time – which perfectly describes the threats of climate change, resource depletion, and species loss. To me, the more interesting question is not “can we get people to respond pre-crisis”. In many ways, that seems moot, because the crisis is here, now. However, it is early days. The crisis can and probably will get much, much worse. The operative question at this point is how bad does it need to be to get the attention of the critical mass, and how can we as communicators overcome the resistance to that message. Eventually the message will be impossible for anyone to ignore, but by that time we may no longer have the resources to respond in any meaningful way. That so many INTJs would be attracted to DtM is, at very least, curious and an interesting observation. Although not an INTJ, I found DtM to be a very important sanity check and have suggested it to people on many occasions. With any problem, boundary conditions are critical and DtM frames those nicely. Essentially, our ‘kick-the-can’ strategy to redress imbalance and entitlement RELIES on the hope that in some future time, growth of the pie will allow for more people to participate without having to ACTUALLY take pie away from someone. In some regards, the entire American narrative is based on the idea of the ‘frontier’ and new resources. Without growth, you’re left with the uncomfortable truth that things may not get ‘better’. That’s a bitter pill and, in some cases, is actually ‘unswallowable’ for some folks. The title may also cause some self-sorting. The word “Math” itself is one of those terms that biases a response. I am not very optimistic about our chances as a species either, but if you step outside of this blog and look at how the people actually lobbying and acting for the various environmental causes look, you would see that there is plenty of any personality types, and perhaps the analytical/abstract thinkers that prevail here are not at all in the majority there. In short, to achieve something you only need to get many people acting efficiently for the same goal; you do not need to get them doing so for the exact same reasons, nor with the exact same means of persuasion. I had never heard of this MB thing before the quiz. I came up an INTJ also. I guess that’s fits with me printing off all the DtM post so I have them saved up for when the power goes off. The zombie apocalypse isn’t if, its when. I’m surrounded by screen zombies already. We think of humans as one species. If we consider functionality, then we might consider two homo sapiens subvarients. I call the subvarients, “Homo sapiens empirico” and “Homo sapiens politico”. Empirico, the earlier form, survived primarily through their skill in observing their environment and making a successful response to those observations. It was a disadvantage to use wishful thinking. To recognize whether a track in the dirt was predator or prey could only benefit if the “hope” is left out of the equation. The truth was what was right before their eyes. inhibits ones ability to project support of the ruling elite. strain now in the majority. The politico strain is expressed strongly in our policy makers and administrators. These people are incapable of empirical observation. They are incapable of seeing what is right before their eyes. They don’t see the weather. They don’t see the forest and they don’t see the trees. They don’t differentiate between science and science styled marketing. It is all the same to them. What you say doesn’t matter. Who says it is what counts. “It is difficult to get a man to understand something, when his salary depends on his not understanding it.” was how Upton Sinclair put it. You could change “his salary” for “keeping his head on his shoulders”. Sure wish you could put out all the DtM info in a book. My stapled together version is wearing out. I see a lot of absolute certainty here (hitssquad is an example). Like Tom, I’m a physicist. Like Tom, I find absolute certainty off-putting. A plausible hypothesis, involving confirmation bias as opposed to selection bias, is that INTJ’s possess some kind of reasoning flaw that causes them to accept a false theory (the cautionary message) as true. This is at least as plausible as asserting that all 15 other personality types contain 15 separate reasoning flaws causing [them] to believe that a true theory (the cautionary message) is false. In fact, from on Occam’s Razor perspective, the former is more likely than the latter. Full disclosure: I’m an INTP that is somewhere in between grudging acceptance and willfully optimistic denial. I guess I’m flawed….. Interesting point: somebody’s flawed. And absent other evidence, the numbers look bad for INTJ. One consideration for me is that I know a lot of INTJs and these don’t tend to be people to fly off on wild ideas. They tend to be calm analysts who question what they know and how they know it (not surprising, as many scientists). I’m not saying they’re right, but just that we should not dismiss the INTJ concerns lightly. Another observation: my perception is that INTPs are well-represented in the comments section. This was the group least likely to commit to the optimism/worry question. Technically, the difference between INTJ and INTP is that the latter favors the intuition dimension, as opposed to the logic/thinking dimension. Based on personal interactions, I associate INTPs with theorists. Abstraction is very important. They’re good at it, and can see options that others might not. So it is not surprising that INTPs can imagine all kinds of ways things might go (for better or worse), and are less likely to bind themselves in worry. I can share the excitement of the INTP, but my practical side won’t let me go too far. Human fallacy may not grant the dreams of the INTP. We can be collectively stupid like that. Imagination will not make it so. I had to parse my comment super quick, sorry a out that. I should elaborate on what I meant by “flawed”. I didn’t mean that the ideas were wild or fringe. But it makes sense that physicists would give greater weight to an argument based on physical constraints. When the counter-argument is based on Economics (i.e. Stamp Collecting), it’s easier to be dismissive. I’m not saying that the Cautionary Message is wrong, just that the data you’ve gathered on MB personality type preferences should make both of us take a harder look at those Stamps. The bi-plane could be upside down…. It’s called a strong hypothesis. Feel free to post counterexamples. Am I really to blame if energy is the Master Resourse; if the 2.77e22 kg crust of the earth contains — at 2.7 ppm — billions of years’ worth of above-unity-EROEI uranium; and if life keeps getting better for people worldwide, and better faster where people enjoy more economic freedom? I like to observe fringe/crackpot movements and apocalyptic groups. It’s a bizarre hobby of mine. I’ve been doing it for years. I’m not saying this blog is an example of it; I find this blog to be extremely reasonable; however I arrived here from observing the peak oil collapse movement, which was a fringe apocalyptic group if ever there was one. I’ve observed many fringe groups, and I’ve noticed that the people who join such groups have similar personality traits. There is a common personality type. Most fringe group members are highly intellectual. They are bookish theorizers. They do their own reading, apart from their formal studies. Furthermore, most of them are very independent and willing to go their own way. Most fringe group members are the “lone scholar” type. Most of them arrived at the group from their own independent study (they were not “recruited”). Most of them actively contribute to the group and post their own theories/speculations. Also, many fringe members are headstrong and confident in their own judgment. That’s why they were willing to go their own way. They realize the group is marginalized. They realize the experts don’t share their views. In order to remain members, they must believe that they understand something which the experts have missed. These things require a degree of intellectual confidence. In summary, most fringe group members are confident lone-scholar types. I suppose that fits pretty well with the INTJ personality. I think people who argue in this way just have not gotten out from behind their desks, steering wheels, etc. to see what is going on, and not going on, in Nature Herself. We can argue online ’til Kingdom Come, but the evidence of what is happening is in front of all our eyes, should we choose to direct our gaze where it counts. I’m seeing remarks like this over and again on this forum. The evidence is “all around us”, and so on. The evidence is “everywhere”. This has a falsifiability problem. I’ve been observing doomsday/collapse type groups for many years, and in every case “the evidence is all around you”. That’s because such groups can interpret everything as a sign of the coming collapse. Things like recessions, road wear, banking panics, stock market crashes, changes in oil prices, and so on, are signs of the coming collapse. However, those things happen ANYWAY so they are not evidence in favor of any theory. If “everything” is evidence in favor of your theory, then nothing is. I don’t think there has ever been a successful prediction in the energy decline community of something that wasn’t happening anyway. As a result, it is not a scientifically supported theory. I’m not a reader of your blog, though after seeing this post referenced on several MBTI-related subreddits, I did try to get through a post or two. As an INTP who’s not particularly mathematically-inclined, I couldn’t keep reading. Your blog is about something that seems to me to be an obvious side-effect of our planet’s pending ecological collapse. These days, I don’t personally have the patience to wade through a lot of mathematical analysis of something that seems to be a foregone conclusion. When I was younger, maybe I could have. I’d have seen it as my duty to absorb every last detail and bit of relevant information to be “informed.” Now I just want to get to the bottom line and find out what practical things I can do to forestall the inevitable. That does nothing to address the real problem with your post, however. The MBTI isn’t supposed to be used as a weapon to justify INTx superiority. It’s supposed to be a tool to help you understand how others think, how to appreciate their strengths, and how to communicate with them. People of different types aren’t “programmed” to care about certain problems and aren’t incapable of understanding long-term problems. As several other posters have commented, the problem is that your heavily analytical communication style isn’t going to appeal to most types. Sensors like direct, practical communication, Feelers like a more emotionally accessible style. The question is, what is your real goal? Is it to inform a broad audience? To inspire them? To be a one-stop shop for analysis of the problem? Suggestion: Find a way to collaborate with people of other types who share your views. Maybe launch a secondary, collaborative blog in which you blend practicality, ethical issues that impact the problem, and scientific analysis. You’ll probably have quite a few students of other personality types who can help out. Form connections with activists on other related issues like overpopulation, climate control and environmental conservation and allow them to contribute and shape a movement. Other web sites where NTs are overrepresented are Less Wrong and Quora, which seem to attract the science-y crowd. I wouldn’t be surprised if most of the posters on Climate Etc. (Judith Curry’s site for discussing climate change, which seems to tilt toward skepticism of the catastrophic global warming) are also from that crowd. In general NTs are overrepresented on the more intellectual parts of the internet. I doubt this expresses anything about an ingrained human psychology. I believe most personality traits are acquired and mutable, and many cognitive habits can be taught. It may say more about culture than human nature. I read somewhere that the prevalence of MBTI types is different in Asian cultures. I’ve also been bothered for a while about people tending to conflate “being good at math\ engineering\ science” to being an NT. NTs tend to try to fit everything into an over-arching theory, picture or narrative. As an INTP physicist and a lover of “grand unified theories”, I can say this tendency may contribute to blind spots, cause you to look for patterns, elegance and connections where there may be none, or to ignore evidence that doesn’t fit nicely in your cognitive framework or mythology. Am an INTJ myself, and not surprised of the result – of course I don’t bet on it being truly “scientific”. The question I ponder over is also to what extent the proportion of different personalities are also influenced by culture and society at large. Do you know the proportion of the different personalities in different countries. I assume your figures are from the USA? In any case, it was an entertaining post! Hi Tom, long time reader, and first time poster here. I appreciate all of your efforts on this site, and look forward to each new post. You provide a level of detail and realism to your posts that speaks to me. 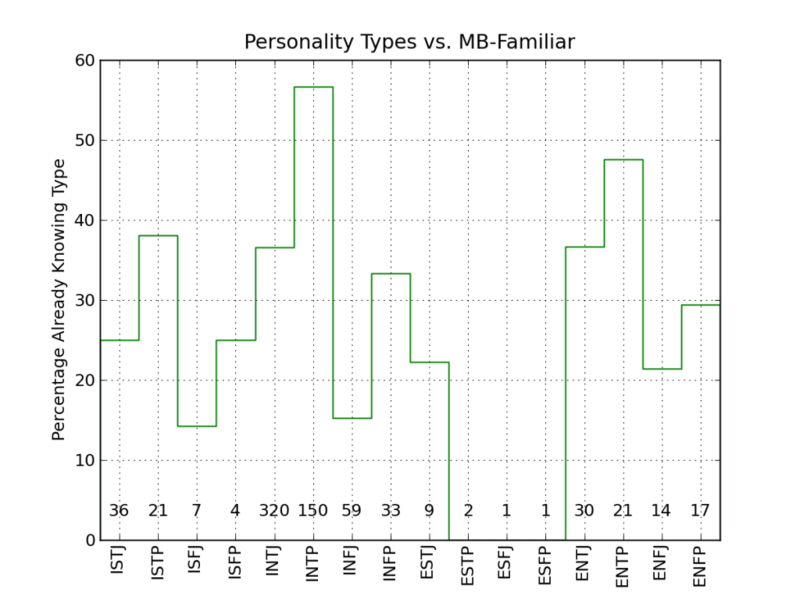 – From memory, I believe peakoil.com also did a survey of their members with regards to MBTI preferences. The top three? INTJ, INTP, and INFJ. – If you’re familiar with the MBTI, you may want to take a look at some of David Keirsey’s work as well. I tend to use his version of the four temperaments (SJ, SP, NF, NT) as my “go-to” for quick and accurate typology, and fill in the other two letters later. In this instance, I’m referring to Keirsey’s mention of orientation for each of the four types. SJ types tend to use the past as a reference for the future, SPs tend to be primarily present-oriented, but only NTs and NFs tend to dwell in the future – often to the neglect of the present. So the iNtuitives can often see a problem coming, but often have no way to phrase it in a “right now” or “look at what happened in the past” sort of way to reach the other 70-ish percent of people. So people tend to keep on doing what they’ve always done… until they can’t anymore. – Finally, for those on the fence regarding the “validity” of the MBTI, it has been noted that the four scales used by the MBTI correlate quite nicely to 4 of the 5 scales on the Big 5 personality test, which is the standard-bearer in personality testing, and has amassed a plethora of supporting data. The Wikipedia article on the MBTI has a direct link to the study used to correlate the two metrics. Keep up the good work, Tom! It can be depressing being one of a small number to see a problem coming, but it least it means you can try to prepare for it. Darn, I don’t remember my type. I didn’t know it before the survey and didn’t record/remember the result after I replied. I’ll have to go take the test again to see where I fit in. I find the results interesting, but I agree that the personality type skew is probably more a function of the format than the regard towards the message. Some more information for your dataset. I ran the first version of the poll, the one without the question about the profile. What’s funny is I got a MBTI profile 10 years ago, and it said ENFP. Some days ago, while reading your instructions, I didn’t any clue the questions were to profile me and the result is….the same, 10 years after, I’m still ENFP! Despite being ENFP, I’m trying to carefully read your blog posts, and I’m deeply concerned the wall we’re going to crash on. Tom, I am a big fan of yours and have found your blog to be an excellent resource. Really – Why discount other understanding modalities that aren’t quantitative? These aren’t climate change refuseniks, just people with different methods of understanding. Bring on the folk singers! Excellent point! I am an engineer (retired). My father was an artist, and he was the one who encouraged my interest in science and, later, engineering. Later, when I was a practicing engineer, he was still interested in what I was doing, often making some excellent suggestions. I never met anybody who could better look at something considering economics, material science, mathematics, history and often more. (Well, two of my granddaughters are also like that, but they are quite young.) He would say that when something is good, it has good aesthetics, whether or not a person can perceive it. My type came out as ENFJ. I wonder how I ever made it in engineering. I am INTJ too. The limitation with “experiencing” things as S’s do is that the processes driving society and the economy can’t be felt. You can’t see or feel energy, although you can of the effects of energy. The second law describes energy flow but entropy can’t be sensed. Hardly anyone has the foggiest clue what entropy is, let alone “sense” it. The best that can be done is to experience heat as a proxy for entropy but that is totally dwarfed by all the sunlight and its own heat bathing us, so our senses give no indication of what’s happening. The decreasing EROEI from 100:1 to 5:1 can’t be sensed, other than an astute observer might notice that the energy extraction sector would be taking up a greater proportion of the total economy’s activity than it used to. Only rational abstraction coupled with intuition can make sense of these issues which may be why the N’s are so well represented here over the S’s that rely more on direct experience. Amazingly, in my searches I have found that not a single person in the world has successfully described how energy moves through economies to produce what we call “wealth”. Not a one, unless I have missed someone. I think Tom has gone the furthest with one of his later posts, “Elusive Entropy”, when trying to make some relevance between entropy and economic activity, noting that not all economic activity directly generates thermodynamic entropy as a direct result of the desired process itself, whereas other economic activity does. But that post just scratched the surface and is something I’m currently expanding: how do energy flows and entropy interact with and enable the various economic production processes? This should be one of the most fundamental pursuits of economics upon which everything else is derived; something fully understood by the field, but amazingly all I hear is crickets chirping. Believe it or not but the Wikipedia page for “Economic Production” was basically empty up until last year and even now it doesn’t really say much of substance – about probably the most important fundamental concept in economics. This reveals to me a very interesting and in a way disturbing characteristic of the human mind. We are not logical, nothing like computers, not even close. Instead, we make up most of our own personal understandings of the world in our own heads based on the objects and stories that we create during our early years, and continue to refine somewhat as we get older. I see human world views more like a Grand Canyon of unknowns, punctuated with the occasional hoodoo spires of knowledge reaching up to the elevation of the surrounding plain. We understand a few things but the vast majority we do not. In order to function in the world our brains build suspension bridges between the hoodoos in an attempt to relate all our disjointed tidbits of knowledge into a somewhat coherent narrative. This is how the most important concept in economics has been completely overlooked by academia– because everyone simply builds bridges around the topic of “production” to avoid that uneasy feeling of not understanding and the associated uncomfortable rearranging of neuronal connections that this state leads to, and to make the rest of our narratives make sense. All economists think they understand production and this is apparent when you read anything they say, but no one actually does. Economists derive all their wonderful abstract ideas in isolation from engineers and scientists. There is no cross-talk and virtually no science is incorporated into any economic school of thought other than thermo-economics, besides the fairly obvious observation that energy drives economic activity. Well of course, but how specifically do those processes work? There may be something to this, personality-wise. It would be interesting to see what personality type economists mostly represent. Are so many engineers and scientists INTJ because not only do they think about abstract things (N) but also put these ideas to the test in the real world? Maybe economists tend to not do that second step of looking for real world evidence because they fall into a different personality type. What I observed from several cases in my bachelor’s studies — good economist was one, who switched from physics to economics (as mathematics in physics was too hard for them). As a consequence from that — these who started as economists from beginning, were just average or below average ones. Mark, I can sense and see the entropy.. it’s all around us. In your soup bowl that is cooling off.. in the bad roads and peeling paint of Everytown, USA. Have you looked into the works of Frederick Soddy, or Georgescu-Roegen, or Herman Daly? (I don’t agree with Daly’s “steady state” model”, though). There are a number of people who have explored and continue to explore this.. yes, not without political and social cost. Steve Keen kind of nibbles around the edges. Look into the group doing “Ecological Economics” for a start, anyway. I think they fall short, viewing the environment as a prostitute from whom we extract “ecosystem services”, but they are at least ahead of most others who call themselves economists. I think this is what Tom is partly disagreeing with, and I mostly disagree with (although I’ve been guilty of furthering that explanation) — that many economic processes don’t actually necessarily increase the entropy of the materials in question, directly. Of course anytime anything happens the entropy of the universe inevitably increases, but in many cases it’s a side effect of the desired process, not the process itself. Perhaps it’s my engineering and scientific background, but I want to flesh out the specific processes themselves governing the economic activities that we generally consider to represent wealth; that economists would identify as having contributed to wealth creation and economic growth. •	A transistor vs. ??? •	Electrical transmission high wires vs. ??? Most of the above technologies or social innovations supposedly improve our lives over what we’d experience as cavemen (they “produce” wealth). But only a few by necessity generate loads of thermodynamic entropy in a manner that calls in Carnot Limits. So what processes are going on in those other technologies? Would these advancements continue if the economy as a whole hit energy limits? Which would still be available after we fall off the energy cliff? One of my beefs with traditional economics is that the differences amongst the above processes are completely overlooked. Economics identifies two inputs to production that an engineer would concern himself with –“materials” and “energy”, and they are acted on by labour and “technology”. An externality created is “pollution”. Another great term I love that’s always included in the flow charts is “capital”, whatever that is. But those terms aren’t actual processes or things. No engineer deals directly with them because they are abstractions. And they are not elaborated in mainstream economics. A vaccine is lumped in with an electric car as both representing “technology”, yet they are completely different. Can CO2 be lumped in with PCB’s as “pollution”? It’s meaningless. It’s yet another step to recognize that the economy is actually a part of the ecosystem, and to develop this we need to understand the specific processes themselves and how they interact with the rest of the environment. Terms like “pollution”, “materials”, “energy”, “capital” and “technology” aren’t very helpful in this regard. You should be extremely careful with that kind of remark. In every pseudoscientific group I’ve encountered, there are many people who say things like “nobody can see what I see” or “all the experts in field x are just dumb compared to us”. In all cases, the group ascribes unique or remarkable insight to its members. If I were you, I would desist from theorizing about any topic at least until you really understand what the experts in that topic are saying. If you honestly can read economics journals and comprehend what they’re saying and why, then fine. If not, then it is It is VERY unlikely you are blazing some path to which not a single person in the world has given serious attention. Point well taken. I should qualify that a bit. It’s not that humanity as a whole does not possess the knowledge to understand economic production from start to finish. Of course we do, since we’re doing it. What I mean is that there is no single person who understands it from start to finish, competently enough to be formulating sound economic/ecological policy. Scientists and engineers understand the processes, but generally not the bigger economic picture. Economists attempt to describe the bigger picture in order to manage the scientists and engineers but they are using flawed and incomplete foundations. This is why I don’t need to understand the complex models in economics journals because I know that the foundations upon which they are derived are flawed. These are all abstractions. There is no link to any real world process that a scientist or engineer actually designing the infrastructure to effect “production” would work with. I take issue with almost every term in the above definition. What exactly are we “producing”? “Goods and services”? What are those? Do they equate to matter and energy? But the laws of physics state that matter and energy can be neither created nor destroyed. And how do these goods and services get “consumed” at the end? Do they disappear from the universe? Or just turned into “pollution”? Is it instead that “labour”, “know-how”, and “capital” are combining to REARRANGE matter and energy? That’s more like it, but how is this being done? What processes are going on to do the rearranging? This is where traditional economics has virtually nothing to say other than the recognition that energy drives it all. Instead, this other term “utility’ is brought in to bridge those abstract ideas with the real world. Utility is a measure of human satisfaction from consuming things. Beyond the philosophical disagreement I have with happiness coming from material consumption, the more practical problem with using this as the basis for guiding economic activity is that what is in the best material interest of a single human, and collectively 7 billion humans, is not in the best interest of a sustainable economy, for a multitude of reasons, prime among them being the irrationality and short term nature of human desires. We are genetically adapted for me-me-me in the African plains. Ecological constraints have historically kept this within bounds but today, economists actually try to CATER to those desires and argue that we have escaped ecological bounds! If one believes that humans create wealth, then great, bring on more humans and economic activity! But if one understands that wealth comes from the ecosystem, merely guided by humans, then the implications are quite different. This is why it is so important to understand how production happens at the process level; does wealth come from people, or from nature? Or a combination of the two? If so, then how specifically? The answer to this isn’t simple because of the wide variety of economic activities we identify as contributing to wealth, like what I listed in the previous comment. Economics is about how the economy is organized. It’s about how economic actors communicate and control prices. It’s about decisions, calculations, organization, and information. As such, it’s on a much higher level of abstraction than physics or thermodynamics. Economics is about the organization and production decisions which take place within economies, and which are bound by the constraints of the physical world. Frankly, I don’t think economists should answer questions about matter or energy. They should leave that to physicists or chemists and then describe the organization of the economy which will occur within those physical constraints. Generally economists just take for granted things which are discovered by physical scientists. If there is only enough lithium in the world for x number of electric cars, then so be it. Goods are arrangements of matter which suit some economic purpose or provide some utility, so that someone is willing to pay for them. Consumption refers to the purchase of such goods. After the goods are used, they are dispersed, thrown away, or recycled. That’s because it’s not a question of economics. It’s a question of engineering and science, and economists don’t intrude upon that. Let me give an example which is close to home here: ocean shipping. I bring up that example because peak oilers have repeatedly claimed that ocean shipping would soon decline precipitously because of peak oil. Also, I love all things nautical so I love discussing it. Ships are subject to two kinds of drag: form drag and frictional drag. Form drag is caused by the ship pushing water out of the way in front, causing a “bow wave”; it increases with the square of velocity. Frictional drag is caused by friction of water against the hull of the ship; it increases linearly with velocity, and is proportional to the “wetted surface area” of the ship. As the ship moves faster, form drag predominates because it increases with the square of velocity whereas frictional drag increases only linearly. These are physical laws which economists would just take for granted. Those physical facts have interesting implications. They imply that a ship which travels at half the speed gets almost twice the fuel economy per ton-mile. They also imply that a ship which is 4x the size gets almost twice the fuel economy per ton-mile. Shipping companies place orders for ships, and specify the ships’ dimensions and cruising speed. As a result, shipping companies SELECT a level of fuel efficiency (within limits). How do they make that decision? How should they calculate the optimal ship size and speed? Decision-makers at shipping companies perform a calculation based upon the price of fuel, the price of materials, the cost of delays, the anticipated price of fuel, how much needs to be transported and how far, and so on. Then they order a ship. That is an economic decision. There are billions of such economic decisions happening everyday, which is the subject matter of economics. If you want to know how the ship is built, you must ask engineers at a shipbuilding company. You should check out the books by Robert U. Ayres and colleagues. He tackles *exactly* what you’re discussing: the relationship between energy (specifically exergy or thermodynamic availability) and economic growth. He’s both a physicist and economist (currently at INSEAD in Fontainebleau). Ayres focuses a lot on the concept of useful work (henceforth availability), but you can’t optimize a system based on that variable alone — economics comes into play. It’s obvious that using electricity (extremely high availability) to heat a room is wasteful from a purely thermodynamics perspective: electricity has the potential to perform high-quality work, so why “waste” it by heating a room to 70 deg F? But in the Pacific NW, for example, many homes use electricity for heating because it’s cheap and reliable thanks to all the dams. Based on the Ayres and Warr model, you can continue to drive economic growth as long as you use availability more efficiently overall. (Availability is not a conserved quantity like energy, btw.) One example is burning natural gas in a cogeneration system instead of a traditional off-site power plant: you produce electricity first and then use the waste heat for lower-quality services like heating water or air. You burn the same quantity of natural gas, only in the cogen model you’re not squandering as much availability. That’s exactly what I’m talking about. How can they describe the organization of the economy when they don’t know how the economy works? A good manager/president who does not have the time to understand everything about how his company/country runs values and accepts information provided by competent subordinates/ministers. For some reason economists want to be the leaders running the show, but resist accepting insight from scientists (I understand that this is a natural human reaction to being told that what you are doing is mostly wrong but what alternative is there?) What if scientists say that the economy is currently operating beyond the constraints of the environment that supports it and that economic growth cannot continue? It seems economists don’t like being told that and get all defensive and start accusing scientists of being unscientific. 1)	About 97% of the energy powering economic activity comes from burning dead things that used to be alive. This is true both today and 10,000 years ago. We are as dependent on ecosystems as ever. 2)	There is no trend away from burning dead things for 97% of our energy. Furthermore, the overall magnitude of energy demand, not just the ratio of energy sources, increases with each year of economic growth, making the inevitable weaning off FF’s even more problematic. 3)	The economic processes that really matter (meaning supporting human life; not taking selfies on your phone) have reached or are nearing thermodynamic limits. There is little room for advancement. This would be things like internal combustion engine efficiency, agricultural productivity, water. 4)	Information technology continues to advance but you can’t eat it..
5)	The amount of dead things we now consume is roughly 20% of the planet’s total net primary production, and that high % is totally subsidized by using fossil fuels (dead dinosaurs) a million times faster than their deposition rates. 6)	There is no way the planet could provide enough biofuels to replace fossil fuels since global NPP has actually gone down by 10% despite all our artificially stimulated agricultural yields, which again are totally dependent on FF’s. Catch 22. 7)	Without the energy provided by fossil fuels we are well beyond Malthusian overshoot, about 5-fold. 8)	Overall EROEI has dropped from 100:1 to between 5:1 and 10:1. IT has helped us find and use these poorer sources of energy more efficiently but with increasing efficiency and greater population comes decreasing resilience. Those are the facts and trends that form the underpinnings of the doomsayers that you disregard as being pseudoscientific. But any rational person would agree that those trends reveal that we are far into overshoot and this is not sustainable. The rabbits pulled out of our hats to avert disaster so far have been 1) financial shenanigans which are hiding the true nature of our predicament from being revealed in the markets (I predict that this will soon fall apart), 2) IT which helps us find more fossil fuels and improve efficiencies in all corners of the economy. Can IT continue its miracles? I don’t think so. It’s a dangerous reliance to push to the limit because IT requires social cohesion. If disaster strikes for whatever reason (such as financial collapse?) then things could go down quickly. We’re just going back and forth now, so I’ll try to be brief. You’re repeatedly presenting fringe material as if it were the consensus of scientists. Your points numbered 2, 3, 7, and 8 are not supported by a consensus of scientists. As an example, this “overshoot and die off” stuff (#7) was misapplied from ecology by a single person (William Catton) who claimed that die-off was imminent back in the 1970s. The ERoEI stuff (#8) is just a mess. Your points #4 and #6 probably would be supported by a consensus of scientists, but do not support your point. Where are economists advocating that we replace all fossil fuels with biofuels only? Your point #9 appears to be your own insight. No they don’t. They resist accepting insight from fringe pseudoscientific groups with a history of failed doomsday predictions. Some details are wrong, of course, but I can’t find anything wrong with the overall logic. Nuclear doesn’t currently provide all 20 terawatts of the world’s power, but if it did, the 75 trillion tonnes of above-unity-EROEI uranium in the earth’s crust could be said to be 9.7 billion years’ worth. Godesky’s estimate was off by 8 orders of magnitude. I’m INTJ and present information in a way I would prefer to see it. So naturally it has appeal to my same type. Not all INTJs are cozy with math/graphs, but perhaps the mathy among us tend to be INTJ or close cousin. So I might hastily conclude that this is all a spurious result of self-appeal. And while I think some of that is at play, I am reminded that the original motivation came from a Peak Prosperity poll. That forum, as I understand it, is not a quantitative tour de force. Yet the distributions are eerily almost identical. Then there was the Swedish economics/peak site (pointed out in comment by TT) that also shows INTJ prevalence. So I think there is more to it than math and graphs. The simplest, pared-down conclusion I can make from the survey is that Do the Math is not likely to reach more than a few percent of the population. Okay, so I never really expected it would in practice. But it seems that even in principle (given off-scale exposure/advertising) it would still fail to hit its mark. To me, this is a significant revelation. I am justifiably called out when trying to extend this further, to say that the cautionary message will not enjoy widespread acceptance. I still think it is likely a true statement, based on the S vs. N sensibilities and the likelihood that only acute crisis will bring most people around. There might also be some kind of selection bias that makes INTx types more likely to answer questionnaires about personality types. Do you know about what percentage of your readership responded to the poll? A similar dichotomy exists in the Big 5 personality types. Political psychologists have been active in studying differences of late- they found very high predictability of being Republican with people who were high on ‘Conscientiousness’ score. Similarly, if one is high on openness score, one tends to vote democratic. (The suggestion is that those personality types naturally gravitate towards the positions in the 2 parties.) Like anything else its a tendency. 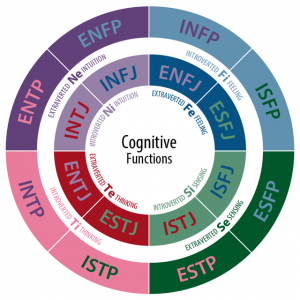 Given our modular minds and evolutionary focus on the present, I think ALL humans will defer doing much about our predicament until its too threatening to ignore, but your Myers Briggs sleuthing is very interesting! I think this is simply one of various ways and various ways to measure how people avoid. As an INTJ who just happened to check your blog in time for the survey, I couldn’t agree with your statement: “I worry that we risk systemic failure if we don’t acknowledge limits to resources and growth”. It was too soft for my understanding of industrial civilization’s current predicament. At this point I am convinced that systemic failure is, to quote JMG, ‘baked into the cake’. I am not worried about the risk; I am preparing for the near certainty of systemic failure (for clarity, I consider this systemic failure to be the current and ongoing decline of industrial civilization). To this end, I’ve found the weekly posts at The Archdruid Report to be a breath of sanity in a world that increasingly strikes me as insane. His theory of catabolic collapse makes sense, and I mention it because I suspect it will resonate with other readers of your blog. It doesn’t matter whether we “acknowledge” limits to growth. They exist and their consequences will be felt regardless of whether we deign to notice them. Thank you for your continued efforts on this blog, and thank you for doing this survey. I expected you would have a statistically significant number of INTJs in your readership, but am shocked by the proportion. It helps me understand why, when I first began to comprehend the myriad issues facing us, my efforts to alert family members were so spectacularly doomed. I think the most straightforward conclusion is that as an INTJ, you’re best at appealing to INTJ (or INTx) types. Your results aren’t surprising to me; the blog *name* is “Do The Math”, it’s mathy, it’s mostly dry — even your personal anecdotes about energy use, while interesting, aren’t touch-feely. Of course this is going to select for NT types. And probably I, given the whole blog thing. Also, your site’s been quiescent for a long time. You’re really selecting for the people who’d notice that you had a new post, months after regular activity died down. Either people who check obsessively, or people with RSS feeds (me), or… I don’t know how else you advertise posts. Before that… your most punchy posts were early on; your late posts were finicky details of measuring your home’s energy use. That probably lost readers. 3. people receptive to the arguments in concise form, who might even have read and agreed with them years ago, but aren’t reading your blog any more. 4. people who not only read or at least looked at every post, to the extent of still being around for these MBTI posts. You’re curious about something like the relative sizes of 1. and 3., but what you actually measured was 4. I’ve noticed that your four points did not include any possibility of sincere disagreement with any of this. For that matter, nobody else here seems to think there could be any sincere disagreement, even as a possibility. If someone disagrees, then that means he must have some kind of unconscious psychological blockage which prevents him from seeing the Truth. Perhaps some people have serious doubts about this kind of thing. Perhaps ESxx people think there is something wrong with relentless failure of prediction. After all, they have that ‘S’ in their personality type which might cause them to compare the predictions against what actually happened in reality. Hopefully an actual S would be more precise about who “these guys” are and what sort of doomsday they predicted. Regarding getting people’s attention, I’d guess that making changes more visible/tangible would be key. The Apollo “pale blue dot” photos of Earth are said to have kickstarted the environmental movement, irrational as it may seem. Someone mentioned the California drought; I always found the time-lapse photos of glacial retreat telling and scary. Regarding MBTI, someone claims it doesn’t have good re-test value? Odd, I’ve never found that to be true. I will say the very first time I took it I got ISTJ, every other time has been INTP or INTJ. If numerical scores are given, I score as InTx — heavily I and T, 60% N, 55% P and wobbly. Some of the questions I can vary answer to based on mood, others not. And like Tom, I read more long-form descriptions than the ones I scored as, to see if it was a cold-reading or astrology thing where everything seems appealing through ambiguous statements. Nope! ESFJ is definitely *not me*. Tom – Convince a bunch of INTJ’s, and they’ll use their skills to go out and convince everyone else with methods properly matched to their personality types. Good to see you’re still blogging. For what it may be worth, I am ENTJ (though I am on right on the fence between I/E). Anyway, I was thinking that if you find this line of inquiry interesting, you might also find interesting/illuminating this book by Bob Altemeyer, “The Authoritarians” (free download). I highly recommend it as another lens for the study of “human nature” in relation to risk perception and decision making. Thanks Tom for providing one more look at why people don’t see a problem and are not acting to resolve it. We have all been frustrated that any logical look at the human condition (barring some technology we cannot imagine) shows billions of people will starve or die in conflict this century. It confounds us that so few want to change this outcome even when it means they personally will be injured. By my computations only radical changes in human behavior and social organization (a new social contract) can reduce overshoot to zero, and implement an ever improving civilization. However, these changes appear too difficult to implement. Our genes are against them. Parts of our evolved brain are against them. Our culture is against them. Our institutions are against them. Most people see my proposed changes as expensive extravagances that obtain nothing of value — specifically they see them avoiding no meaningful liabilities. You and Nate both teach university classes and are trying to understand why nothing we have tired moves a group from fantasy to a view of reality that produces an understanding of what behaviors transition to and maintain sustainability. If some get this view it is not enough to motivation adequate change. Each, along with others, has many explanations of our failures. Tom has correctly observed in his study, lumping people into groups shows some groups get it more than others. It is a first step in understanding what each group needs to make the transition. Actually I think we have to take this customization a step further. I think we should think about these conversions at an individual level. I think we need a “one on one” process. We have to find many customized conversations that happen between just two people where one is willing to vote for a new social contract and the other is not. I hope they contribute a framework to help us make progress. I have been an avid reader of your blog since the beginning, and strongly admire your work in the way clearly conveys a warning based in rational ideas and numbers. I am also one of these INTJ types, so you are definitively into something here. But I disagree about your gloomy predictions , not because they are not plausible, as they obviously are, but my point is that you are too pessimistic about the impact of a small number of influential and commited individuals can have in society. Think about the American or French revolutions, the mental background was done along the 18th century by a few intellectuals and led to those mass movements. In the same way I am concerned about your mood. You have presented a well thought and dispassionate argument , so you have done your bit. Enjoy life and please keep doing this teaching in any way that motivates you, but do not let this gloomy thought dominate you. You cannot do more, you have done more than enough and the future is uncertain as always. I see progress in many ways so I suspect that things might be a little more interesting in the future, but this is just a thought. Another great post Tom. I must say I missed the survey as thought the blog was on hiatus. I’m an ENTP edging towards ENTJ. I’ve given a few points I have on the topic, blog and audience and personality types below. Having found Myers Briggs about 12 years ago, i believe it is a good rule of thumb guide. So I would be confident with your results. I think the big item is presentation of message and who it will appeal too. So DtM is only going to hit a smaller end of the scale for sure. DtM is a fantastic blog. I personally love the detail but some of the intricacies would be difficult for me to put together without alot of effort. Audience – If I had a comment against Tom’s great post it would be the concept of critical mass. I think this is extremely difficult to put in % terms and he has taken an admirable stab. For me the key would be getting the decision makers to agree with issue and a roadmap to counter. These would then heard the masses along. So if you take the MB data then this is a much smaller percentage. your talking about engaging with the ESTP, ESTJ, ENTJ types (~19%) – the leaders of groups and along with what Seth Godin would call the sneezers (ISTP, ENTP think?). Those that spread new ideas. Here the presentation style is vital – the message appeals to the audience. So the concept would have to be put into a suitable style and auguement. I think this is also the problem with the Limits to growth report and one part of the success of Al Gores movie. A final point on MB types. I would love to know a global spread and if this correlates to the USA spread? I have never been able to find one. As if you take the cultural differences around the world, i very much doubt the USA spread is representative. So those % could be well out. Take for example, I’m from the UK, when Bush was running for his second term the Guardian newspaper ran a survey on IQ of states. I dont know sampling etc, Basically Bush voting states came in at average of around 80, Kerry states around 115. Give or take a little for my memory fade. I cant remember exact details but the Bush states at 80 is pretty low, as a population average. So along with MB, geographics will have a significant impact on the message uptake and how it should be presented. So who’s up for developing a solution? I wonder what percentage of your readers are MBFN’s like me. (That’s an abbreviation for “Myers-Briggs is Nonsense”). Whatever the percentage is, I bet we’re underrepresented in your results since we didn’t take the test or report any results to you. I am a long time DtM reader, but you lost me as soon as you mentioned Myers-Briggs, which has very poor test-retest reliability. I.e. a person’s ‘type’ can change in only five weeks. Of what use is it to measure people using a yardstick that changes on a monthly basis? Nor do I find the survey skew to be suggestive of the relevance of MB types. The people coming to this site are already primed for particular ways of thinking, it is no wonder that they perceive themselves as adept in those modes of thinking. Obviously, Myers-Briggs pushes some peoples’ buttons. For some, it may be aversion to being labeled or simplified, or whatever. Or anything starting with psycho immediately calls “babble” to mind. People are obviously a continuum, and a changeable one. Any time hard boundaries are laid down, artificial certainty may result. Many people are borderline in various traits. My wife, for instance is solidly I and J but the middle two can come up anywhere–though never very far from neutral in tests that tell you how strongly you are into that category. I myself am hard enough over that I came up INTJ when I first encountered the test in college, and decades later re-took the test to the same result. A year after that (recently) I was still firmly in INTJ territory. I don’t imagine having results randomly jumping around the MB scale depending on what I ate for breakfast. I would bet that for every person whose MB result is mutable (borderline cases) there are several others who don’t budge. The mutability is a distractor without much meaning. It would not impact the survey results significantly (some minor bin-swapping). So let’s look beyond the fuzzy edges and appreciate that the DtM readership showed a remarkable INT concentration. Could some of the INTJs flit into the INTP bin sometimes? Sure, who cares? You might even take the extreme view that the distribution represents the mushiness of MB: that every DtM reader is the same fundamental type of person (hogwash, obviously), but that MB imprecision dilutes this purity. Even if this were so, the imprecision did not appear to blur things to the point that strong patterns were washed out. In any case, dismissing the result by maligning MB does not seem justified to me. Call it self-selection or whatever (perfectly fine), but there is something real to the MB characterization. I’m not qualified to comment on the validity of Myers-Briggs or any other psychometric testing. But I think that presuming personality types as a static thing that determine and explain behavior is a diversion from the reality of the situation. Wicked problems – economics, environmental degradation, climate change, etc. – are inherently multifaceted. Just as we can find causation in burning of fossil-fuels leading to global warming, we can find that personality types are responsible for global warming, or say greed is leading to global warming – eliminate greed and the problem goes away. The average American watches 5 hours of TV a day. That’s over 1,800 hours a year of “programming to ignore”. Corporations and governments, for the most part, do not want an intuitive, critical thinking and a judging population. Maybe that’s why only 2-3% of the general population are INTJ’s. TV programming is carefully crafted to influence subjects to consume, watch even more TV, and condition them to hold a certain world-view which does not conflict with the interests of states and corporations. I think it is somewhat naive to expect that this “programming” could be undone with a few blog posts, or few hours of rational lectures. Awakening a “critical mass” requires teamwork. While one person explains the mathematics behind physical limits of economic and energy growth in simple terms, another works to educate people on mass-propaganda, and maybe another raises money to get some TV time and raise awareness. In other words, maybe the prevalence of INTJ’s (2-3%) is not natural, but synthetic. I quote your work in numerous one-on-one conversations I have with others. Some do not care, but many – as much as half of the people I interact with – do. My observation is that people are not inherently ignorant. Ignorance (or maybe rationalization) seems to increase with education and conflict of interest [Economists?]. I’m not so sure that personality types are as relevant as availability and communication of alternative narratives. Your work has value. You don’t have to do all the convincing yourself. I listened to your BBC interview with a friend and she was impressed to the point that she brought it up in later conversations. Keep it up. Well worth reading, this guy’s thoughts and insights into the human condition really go some way towards explaining why no one cares. A few years back it was discovered that being optimistic is a survival trait; in that pessimists expect to (and do) undertake less striving and succeeding. Thus optimists thrive vs. pessimists, a feature now ‘hard-coded’ into the biology. Part of this means: Messages perceived as ‘negative’ are not heard / given credence by the masses. Test: Bury $100,000 – let people know it’s in the area – and see how many want to believe it. I have just run across this blog. I hope that I am not too late to add to the discussion. That description may apply to many of the people at this blog site. A few thoughts about this very interesting post. •	I understand that most people are Sensors — they react to what they can see and touch. Hence a computer model to do with the rate at which some obscure glacier with an even more obscure name is melting does not impress them. But the fact that their friends and family in southern California are in the midst of a really bad drought does have an impact. Quite a few of my acquaintances are now saying, “Things don’t seem to be normal”. Even then, they will continue to deny the role of global warming (see the movie clip Hy Brazil is Sinking at https://www.youtube.com/watch?v=qJh6EQ5gv7g ). •	I work in industrial safety. We tend to manage this important topic with reports, root cause analyses and studies of one kind or another. And then we train or re-train the work force. A much better way of communicating safety, however, is through the use of stories and anecdotes. But the catch is that most technical people are not good at telling stories. •	It doesn’t need a large number of people to make a change. The number of Bolsheviks in Russia in 1917 was tiny, but look at the changes they made. •	I like the comments by Tom S on falsifiability. As best I can tell no one predicted the recent major drop in oil prices. Tipping point events such as Sarajevo can happen, but they are impossible to forecast. I have just started a series of posts to do with “Engineering in an Age of Limits” at http://wp.me/p5PqbO-4. This week’s offering is at “Peak Forests”. My theme is that the steam engine created engineering, not the other way around. As the oil age winds down I wonder how will engineering be affected, or if some other discipline built around the concept of entropy come to the fore. Please keep this discussion going — it’s interesting. I would also consider another approach: why is it important to reach many types of people? Maybe it is far more improtant to reach the “right” people, that are actually capable and in charge of chaniging our trajectories. During the World War II in Poland most of the people knew what was going on in terms of Holocaust, did this fact helped to prevent it ? no. I was thinking something very similar as I read this (I’m not a regular reader – found this post via Damn the Matrix). If we want to effect change, we need a strategy based on realistic assessments of the problems and of the resources available to us. The Deep Green Resistance strategy of Decisive Ecological Warfare takes both factors into account. It identifies civilization (especially industrial civ) as the root problem of most of our interlinked environmental and social crises. And by examining historical resistance movements for what’s worked and hasn’t worked in the past, it draws conclusions and lays out a blueprint for what’s needed now. Worth reading and considering as a different approach than all the proposed “solutions” based on wishful thinking (green tech will save us, or a mass movement for sustainability will voluntarily choose a better path, etc). Have you ever considered the idea that this problem may be the answer to the Fermi Paradox? Carl Sagan in particular I remember reading (he died shortly after I was born) suggested that the propensity for civilizations to engage in self-destructive behavior was very high indeed. DeYoung, C. G., Grazioplene, R. G., & Peterson, J. B. (2012). From madness to genius: The Openness/Intellect trait domain as a paradoxical simplex. Journal of Research in Personality, 46, 63–78. Historically though off the top of my head in cognitive tests I > E, although the gap is smaller than the N > S part. IN generally did very well in IQ tests. Of course, the long term implications for our survival aren’t good either. I have indeed considered this, and there are some discussions to this effect in the comments associated with the Why not Space and conversation with the economist posts. In short, we evolved to be smart enough to find and use the buried treasure (fossil fuels), but did not skip a few evolutionary steps to develop wisdom enough not to use them as fast as we can. I think we have some baked-in shortcomings as a species (grant exemptions for individuals) that make long-term thinking and sustainability very difficult goals to achieve. Now here is the disturbing part. If a single species in our galaxy were advanced enough to become a type 3 civilization, or even ~2.5, they’d probably stick out like a sore thumb. 1. The effort to find extrasolar planets has been relatively successful and well … planet formation is not the bottleneck. What this means is that this shifts the bottleneck into the latter variables. 2. There’s now an increased risk that the Great Filter is indeed ahead of us because the variables in the earlier ones are not the bottleneck. 3. If you think about it, a “cultural filter” might be a problem because people are not long term enough. It’s likely that other species would be like that too. I have heard speculation that a planet on the outer edge of the habitable zone (ex: one with more carbon dioxide) might be able to not worry about global warming – especially if their atmosphere is like >3-4% CO2 (might be needed just to prevent their oceans from freezing over or some other greenhouse gas). Of course, they might have problems that we don’t have. Nuclear war is another well known one. But what if there is something that we don’t know about? Some have speculated that virtual reality is a possibility. I’m a bit more skeptical. Dennard scaling has ended for computers (meaning single threaded performance is not getting much faster). Moore’s Law might be over (cost per transistor so far has been cheapest at 28nm) and it becomes a battle versus physics. Perhaps there is some technology we don’t know about. Perhaps 450mm wafes and EUV might give us some time. Current technologies like FinFET 22nm are very high cost though. If computer power does have an upper limit, like aircraft, we may be reaching it and we may be seeing a slowdown in improvement rates for performance. 4. Given the size of the galaxy and the age of the universe, you’d think it’s likely that at least some of the species might have advanced? Unless the Rare Earth Hypothesis is indeed true? All it takes is ONE species to drastically alter the galaxy. We should probably go ahead with the Copernican hypothesis that earth is not a remarkable planet here. 5. Statistically, there do seem to be cultures on earth that fare better. I don’t want to sound racist, but I feel that overall, a culture that is long term oriented, non-materialistic, and egalitarian probably has the best odds. On earth, a case could be made that the Scandinavian culture has done the best (I’m of Asian descent so no bias here). Their living standards certainly reflect that and it probably is not a coincidence that they are pulling ahead into renewable. It makes me wonder if the probably of say P_StarTrekFederationCiv = 0 and P_EndofCiv = 1? Here is another take on the problem.